Every house needs a pathway. Pathways are useful and inviting, and installed with care,they can add to the appeal and value of a home. Flagstone is a popular choice for pathways because it looks natural and creates a smooth walking surface. Flagstone is not a particular type of stone. It’s the term for any big, flat, quarried stone used for pathways, patios, or floors. 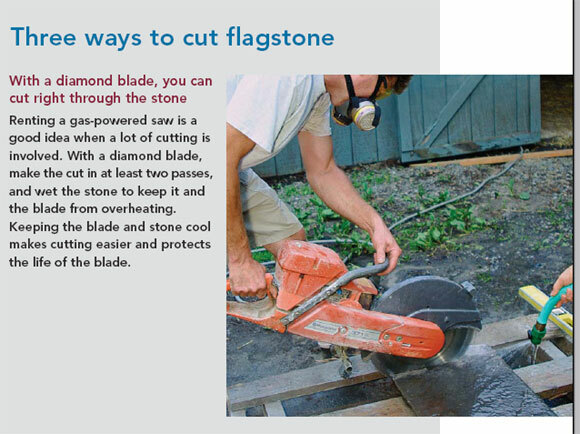 Some flagstone is cut into rectangular shapes, and some has rough, natural edges. 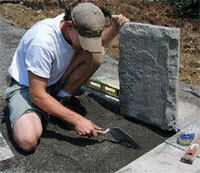 Flagstone can be laid dry (on a bed of stone dust) or wet (in concrete). There are drawbacks to laying a pathway in concrete. It is a more expensive and involved process, and in colder climates, concrete is prone to cracking during freeze/thaw cycles. 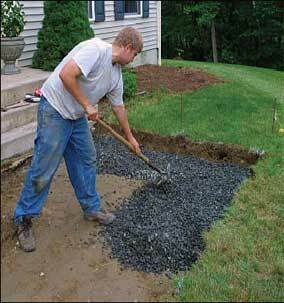 If a stone moves in a dry-laid pathway, it is simple to fix. Also, a dry-laid flagstone pathway looks natural in a mature landscape; concrete detracts from this aesthetic. Once you’ve determined the best path, draw the complete stone pattern on graph paper. It helps when ordering stone and saves time when laying it. It’s easy to draw the pattern because modular flagstone is sold in 6-in. increments. It is best not to lay stones smaller than 12 in. by 18 in. Stones as large as 30 in. by 36 in. can be handled by one person. The pathways path should be direct and connect the most commonly used entries to the street, driveway, or parking area. Before you break ground The best path from the front door to the street or driveway is not the only thing to consider when planning a pathway, but it is the first thing. Walking patterns tend to be similar. If one person cuts a corner when walking around a garden, the next person likely will do the same thing. So when I plan the course of a pathway, I think about the path I would take if there were no pathway in front of me. Although people generally take the shortest path from one place to the next, a pathways should feel comfortable. I like to pull the pathway away from the house so that it doesn’t feel crowded and people can comfortably look at the house or gardens while using the pathway. The distance between the pathway and the house also can affect the perceived size of the house (drawing above). For taller houses, I usually recommend a pathway that is farther from the house, say 12 ft. Also, the space between the pathway and the house likely will be a planting bed, and it is a good idea to give new plants plenty of room to mature. I also consider the house’s style when I decide whether the pathway should be straight or curved. While putting a slight radius on corners softens the look of a straight pathway, a curved pathway can be tricky because people don’t naturally walk in a roundabout path from one place to the next. However, in the right landscape, a curved path can add character and give planting beds an interesting line to play off. A drawing is a great way to plan a pathway, but it isn’t the best way to visualize how it will look in the landscape. I paint the outline of the pathway on the ground to create a better sense of what it will look like . A pattern speeds up the process Once I’ve decided on the path for a pathway, I take the measurements on site and then head inside, where I draw the pathway on graph paper. 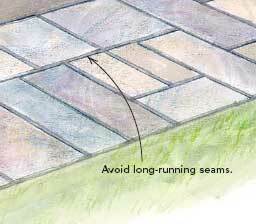 As a general rule, a flagstone pathway should be between 3 ft. and 4 ft. wide. A pathway less than 3 ft. wide can feel awkward and clumsy to pathway on. First, I outline the pathway on graph paper and draw in individual stones. As tedious as this process sounds, it speeds up the construction and allows me to make sure that the pathway’s pattern is balanced and pleasing to look at. 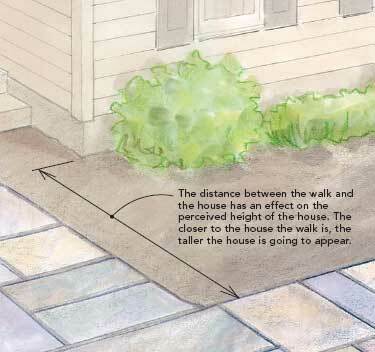 Also, some rules for laying flagstone are easier to observe when the pattern is drawn on paper than when my attention is focused on laying stone. Laying out the pathway on graph paper provides me with a list of stone sizes. And when it comes time to lay the pathway, I know how the stones fit together and can focus my attention on laying the stone rather than trying to figure out what size stone should come next. 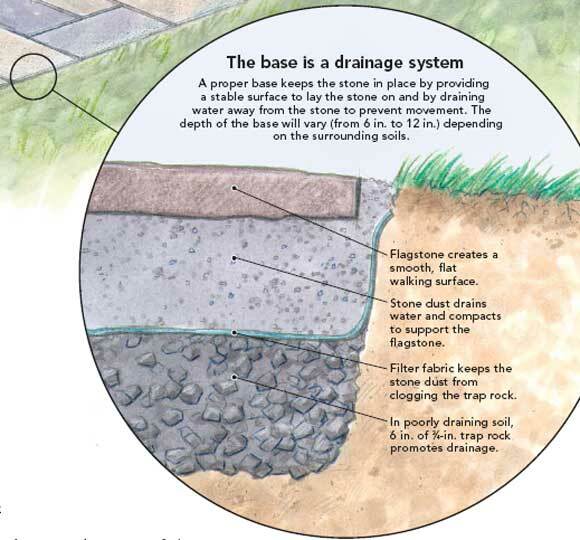 Because water and frost are usually responsible when stones move, a base that drains water away from the paths surface is essential. 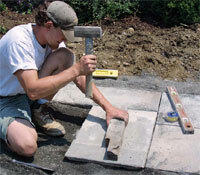 The same base system described here works great for brick and concrete pavers. It’s always a challenge to determine how deep a base needs to be. In a dry area with good drainage, 6 in. of stone dust may be all that is necessary. It all depends on the existing soils. Sand and bank-run gravel provide excellent drainage and require a less extensive base than hard-pan soil or clay. In wet locations, I often dig a 12-in. base and use both trap rock and stone dust, separated by filter fabric, to promote drainage. The materials are inexpensive, so I would rather overbuild a pathway and have it last than under build and a year later have to fix the stones that have moved or loosened. The last thing you want to do is spend hours or days preparing a base just to have it settle after the stones have been set. I use a gas powered tamper to compact the base. If you don’t own one and can’t borrow one, it is worth renting a gas-powered tamper to build a pathway because it does a much better job than a hand tamper. Flagstone is quarried, not perfect. 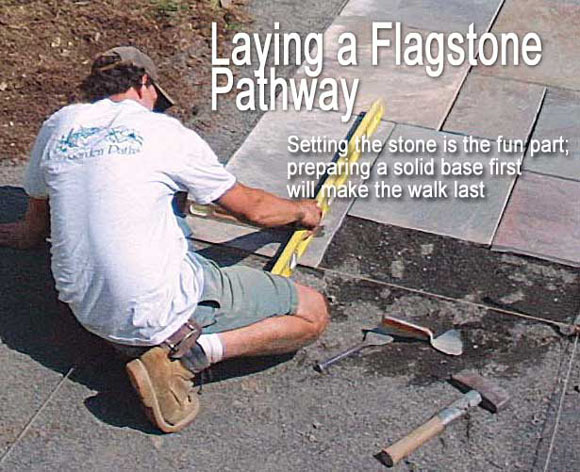 Flagstone is easy to work with, easy to walk on, and reasonably priced. But it’s not perfect. Although the stones are cut to a specific size and thickness, they’re not all the same. An average pallet of flagstone will have some oddly shaped and coloured stone, some stone with cracks, and some stone with horizontal seams that make them prone to splitting. Because of these irregularities, hand-picking stone at the supply yard is time well spent. Even if you’re having it delivered, ask the supplier if you can pick the stone. Be on the lookout for warped stones, irregular shapes and thicknesses, odd colours, cracks, and chips. 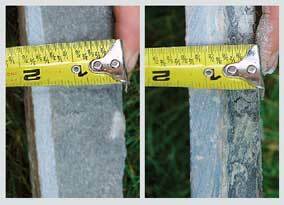 Flagstone thickness can range from 1 in. to 4 in. For a pathway, I like to use 11/2-in. to 2-in.- thick stone. It costs a little more but doesn’t break as easily as 1-in. stone. And although it is heavy enough to stay put, it’s not too heavy to work with. Only the largest sizes require two people to set. 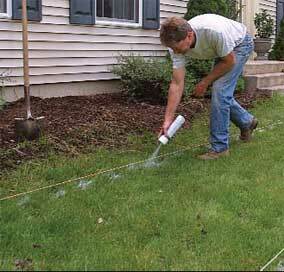 Stakes and string guide you through pathways installation When it comes time to break ground, stakes and string replace paint. The string represents the finished grade of the pathway. You sometimes can set the grade of the pathway by eye, particularly when the pathway follows the natural grade of the landscape. But when the pathway or a portion of the pathway needs to be either perfectly flat or slightly pitched, a builder’s level or a transit may be necessary to set the grade. The string continues to come in handy as the project progresses. 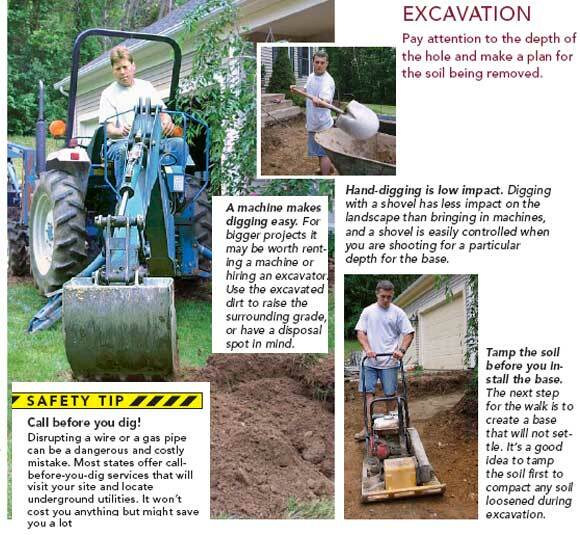 During excavation, you can avoid over digging by measuring down from the string. The string also reveals where the existing grade needs to be raised or lowered to meet the new pathway. 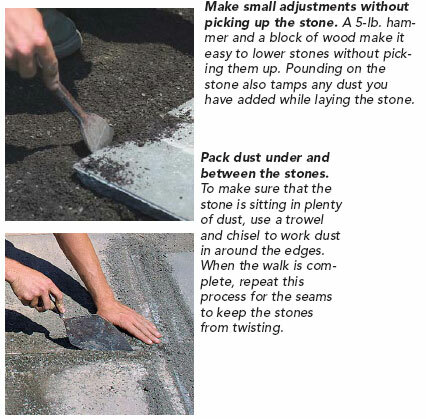 When it comes time to lay the flagstone, the string provides a guide for the top and outside edges of the stone. I still need to use a level on each stone, but the string offers a starting point and a line to keep the paths edges straight. I use mason’s string because it’s braided and is less likely to stretch than wound string. Still, you need to be sure the string is pulled tight, and reset every day; otherwise, it will sag, resulting in a dip in the pathway. Buy stone dust, not sand Stone dust drains water and compacts better than sand, two qualities that prevent the stone from settling or moving. And don’t skip the filter fabric: It keeps the stone dust from washing into the trap rock below. Use the string as a guide and make sure everything is compacted well to avoid settling later. Install the base a little at a time. Spread the trap rock in 3-in. layers and tamp each layer to be sure that it is compacted from top to bottom. The surface of the trap rock will appear compacted after one pass, but continue to tamp the entire path at least two more times. Filter fabric divides the layers. Filter fabric keeps the stone dust from infiltrating the trap rock. Filter fabric is easy to cut with a knife, but have some rocks or hand tools around on a windy day to hold it down until you put in the first layer of stone dust. 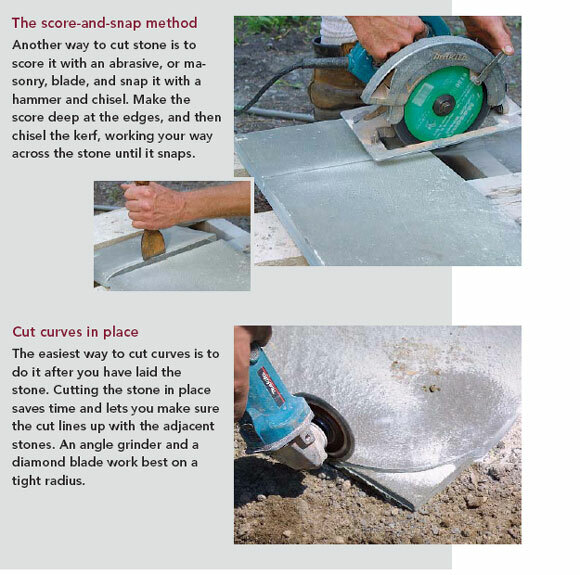 Pick the flagstone yourself Flagstone varies in thickness and quality, and time spent in the stone yard selecting flagstones will be more than made up with time you save laying them. Look for flat, square-cornered stones with no cracks. Avoid stones thinner than 1 in. Laying stone is the fun part. When you lay the stone, it is important that it is set at the correct grade, is level, and is even with other stones. It is also important that the entire bottom of the stone is touching the base to prevent rocking and cracking. Begin at the house, and work your way toward the driveway. If the path meets steps anywhere along the path, measure the risers and make the step onto the path the same height. Lay stones across the path so that you never have to make the stone you are working on meet more than two other stones’edges. Even when I have strings on both sides of the path and the tops of the stones appear to be even, I use a level to double-check everything. If the path meets the foundation, I pitch the path slightly away from the house to shed water. For the most part, laying flagstone is trial and error. You have to set down the stone first to get an idea of what needs to be done to make it sit flat. Sometimes you need to add stone dust, sometimes you need to remove it, and sometimes you need to do a little bit of both. But always tamp any dust that you add or loosen during this laying process. Once I have gotten the stone level, I lean or step on the corners and around the edges to make sure that it doesn’t rock. Then I make my way around the edges of the stone with a trowel and chisel, working loose dust underneath the stone and packing in the dust . If the tool slides easily under the stone, I know the stone has a pocket underneath it where it is not sitting on the base. Fill the joints with a trowel, not a broom. 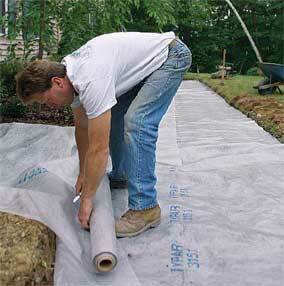 The last step in laying a pathway is to fill the seams with stone dust. Most people simply sweep dust into the seams. I think this is a mistake. Stone dust in the seams keeps the flagstone from shifting, so I work dust into the voids with a trowel. It’s important to work dust into the voids and not just pack it down. 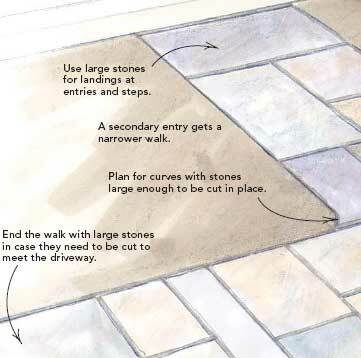 Don’t begin this process until the entire pathway is laid in case you want to move stones to straighten seams.